Josh Corbett, who scored his first goal of the season in Pontefract Collieries' promotion clinching win at Lincoln. An emphatic 7-0 win against Lincoln Moorlands Railway saw Pontefract Collieries celebrate promotion to the Premier Division of the Toolstation NCE League in great style on Saturday. Colls travelled to Lincoln knowing that three points would secure their return to the Premier after a gap of 15 years and what could have been a potential banana skin turned out to be a romp in the park as they scored seven goals for the fourth time this season to achieve their long awaited promotion ambition. After the frenetic game at Hemsworth MW in midweek it was a contrasting comfortable outing for Ponte who were pleased to have Craig Parry in goal after usual outfield player Iwan Heeley had deputised in the local derby. Heeley was back to his regular right-back berth and Lee Bennett came in at number seven for the injured Andy Catton. From the outset Colls pushed up and condensed play in the Lincoln half. For the first 10 minutes they prodded and probed looking for the way through before the home defence cracked as Mark Whitehouse followed up a Lee Radford shot that had been spilled by the keeper. The prolific Aaron Moxam was not going to miss out on the scoring and he added a second and a third on 28 and 35 minutes with Whitehouse claiming the assist on both. When Luke Danville prodded home the fourth on 38 minutes it was 4-0 and effectively all over bar the celebrations. The second half started as the first finished with Ponte camped in the Lincoln half. Manager Nick Handley brought on Phil Lindley, Matthew Marsden and Craig Rouse for Heeley, Radford and Whitehouse and pushed Josh Corbett into the front line to give him an opportunity to break his season long goal scoring duck. Marsden was the first of the subs to score on 66 minutes following up some good work by Bennett. 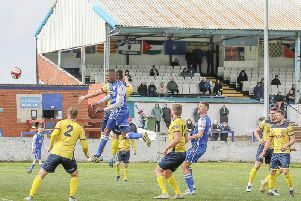 Corbett’s opportunity came on 81 minutes as he scored with a little help from a Lincoln defender’s leg and the goalpost. Rouse then blasted home the seventh goal two minutes from time. With the final whistle came relief for Lincoln and jubilation for Pontefract with promotion to the top flight achieved. Colls are now going for the championship, but maybe had been guilty of celebrating too much as they suffered a 3-0 defeat on Tuesday night at Hallam. With the intensity of the promotion campaign over, they never got going and were two down by half-time after conceding two goals in four minutes to Michael Blythen on 33 and Jack Hargreaves on 37. Any hopes of a comeback were dashed when Hargreaves bagged his second on 69 minutes. With second-placed Clipstone winning 3-0 at Worsbrough Bridge Athletic to confirm their promotion Ponte’s lead at the top has now been cut to one point with Clipstone having a game in hand. Colls can still clinch the title, however, if they win their last game and their rivals fail to win both their remaining matches, at Winterton Rangers on Saturday and at home to Shirebrook Town on May 2. Pontefract play their final game of the season at home to AFC Mansfield (3pm) this Saturday when whatever the result they are planning a big party.